Take time to walk the Cotswolds away from the crowds and you will be rewarded with a magical journey through its delightful stone villages and beautiful English landscapes. Starting in the North of the Cotswolds near Chipping Campden your trail takes you across the county via Stow on the Wold and leads you close to the market town of Burford. 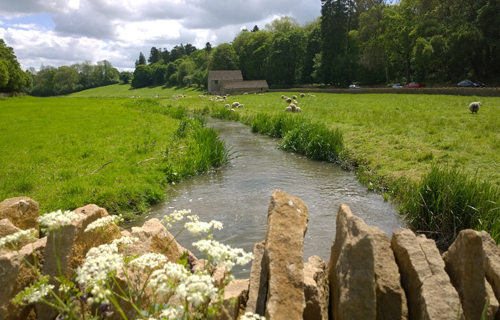 Prepare for a quiet journey through the Cotswolds (away from the crowds which do feature in some areas) with a trail Foot Trails created especially for our guests. This inn to inn style (village to village) walking tour connects you with traditional stone villages and the stories and heritage associated with the area’s wool industry. Start points vary as each trip is custom planned, but you could start for example in the North of the Cotswolds near Chipping Campden, crossing the county via Stow on the Wold and walking on close to the market town of Burford. 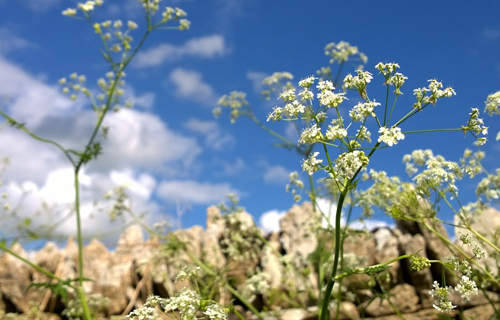 You’ll walk on local paths not busy well known national trails such as The Cotswolds Way. This more authentic approach to walking brings a real sense of exploration as well as more peaceful walking in this popular area. Sleep and eat at country pubs and country inns chosen personally by our founder. 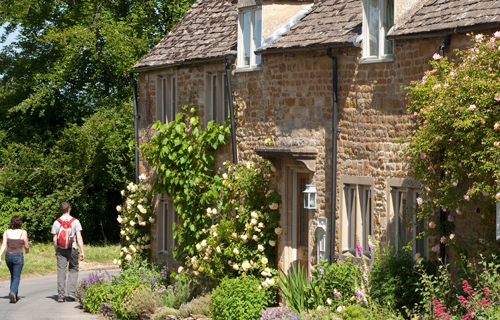 Journey Across the Cotswolds is a 4 night, 6 night or 8 night linear (one-way!) trail that leads from one country inn to another. You’ll spend two nights at each, for a more relaxing experience that avoids the need to pack and re-pack several times a day. Daily trails vary in lengths from 7 to 12 miles (12km to 20km). Our expertise and Foot Trails unique flexible approach means you can have flexibility to lengthen or shorten some days. All luggage transfers during your holiday are included with our trusted driver team so you can enjoy a car-free break walking with a light day sack only (just you and your feet!). Arrive by public transport or bring your car to the start (we can help organise a transfer to collect your car at the end of your holiday). Getting here is easy, your trail start point will vary as each trip is custom made, but could be near Chipping Campden, Gloucestershire. We will confirm your details. Its about a 2 hour car journey from London and around 1 hour from Birmingham. For a truly car-free option the nearest train station for arrivals is Moreton in Marsh. Transfer from the station to your inn is about 15 minutes. We can help you arrange this. 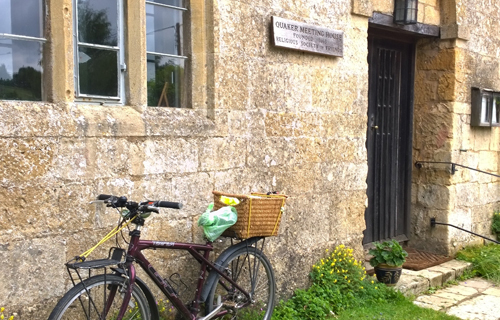 At the end of your trail the nearest train station is at Charlbury, Oxfordshire or Oxford itself. Again we can help. For overseas guests the nearest airport is at Birmingham. London Heathrow is also easy to get to. Airport transfers can be arranged with chauffeured cars, just ask. All Foot Trails holidays and vacations are unique giving you accommodation in gorgeous country inns and country pubs. Each is personally chosen by our founder Alison Howell for its location, food and drink, warm welcome, authenticity and wonderful bedrooms. They are tried and tested and much loved by our guests. On the Journey Across the Cotswolds inn to inn trail you will enjoy a different country inn every two days, giving you the opportunity to explore where you are before moving on, build in rest days and of course enjoy the comfort of the inn. 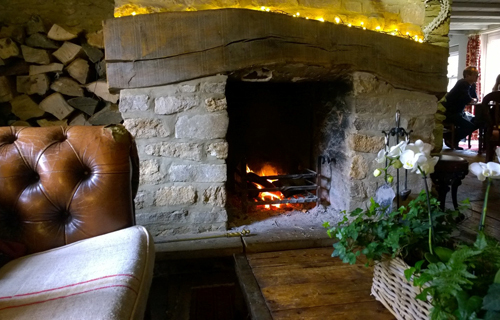 Your Journey Across the Cotswolds trail is based in up to four Cotswolds country inns & pubs. All have high standards of quality in accommodation (your bedroom!) and food (your evening meals!). 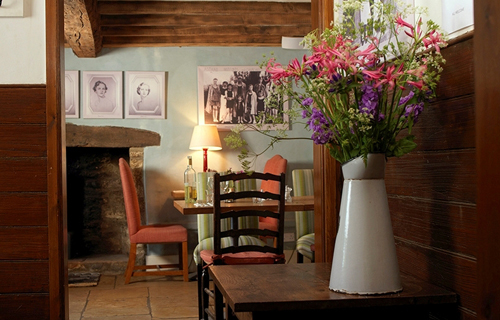 Your inns & pubs include a gorgeous 17th century country inn with luxury bedrooms, cosy local bars, great restaurant and food all set in a quiet picturesque village. Then you journey to a former 16th century cider house, now a delightful country pub full of country style and charm, delightful bedrooms, great food and atmosphere and all set on a village green where ducks and hens roam free. Your final inn is an indulgent country pub with characterful and delightful bedrooms, cosy local bars as well as fine dining restaurant. All set by the banks of the river surrounded by gorgeous countryside. You are in for a real treat! Your walking trip will be planned and custom made to suit you and the English season. There are no fixed scheduled dates. We do strongly recommend booking in advance, Foot Trails are popular and places each month limited. *Based on two sharing en-suite accommodation, staying on a bed & breakfast basis. Includes all luggage transfers, accommodation & transport. • Foot Trails expertise and experience, working with our Trail Consultants to custom made your trip to suit you and the English season • Tailored and crafted Walk and Explore Box with everything you need • Local Ordnance Survey™ map exerts (waterproof) with your trails annotated • Trail guide cards (waterproof one for each day with easy to follow word instructions) • Local stories and histories • Recommended lunchtime stops at country pubs and cafes • Nature cards for identifying wild flowers, trees and animals • Seasonal nature guide book • Sweets (for a boost on route) • Your en-suite accommodation • Breakfasts • One bottle of wine • Two decades of expertise and know-how • Inn to Inn luggage transfers with our trusted driver team • Drop off services when it makes a walk better. Just get in touch as soon as possible with your preferred dates and we will look after the rest. You can call us on +44 (0) 1747 820626 or use the form to your right to send a message or request an itinerary. We recommend booking early as places each month are limited. You will receive a full and detailed itinerary with price quote before you book. We both loved our adventure prepared by you and David. So much so, that we want to go on another one this spring! Good maps and instructions. The waterproof paper proved to be MOST important. Fantastic accommodations and food. We loved every place we stayed. In fact, as the days went by they seemed to get better and better! Beautiful terrain. We got some extraordinary photos and were surprised we NEVER saw another tourist! Trails are devised using our local knowledge and rigorously tested and checked. Find your way using either the easy to follow trail cards if you prefer not to map read, or the local Ordnance survey maps provided. Or a combination of both. For peace of mind an on call service is provided every day including weekends between 8am and 6pm. Where will I be walking? Your walks are on public rights of way and a mixture of paths, tracks and trails through woodland, on farm land, village country lanes and countryside. Most walking is away from roads. Everything you need will be provided in your walk and explore pack. For a more fully detailed example itinerary for this holiday, simply pop your details in the form to the right.